Awesome. Don't be intimidated by the 1+ hr length, they go by fast. Thanks a lot for flagging this. Not only PJ, but also Don Fogg's,Powning, Pikula...on topics as varied as sword making, nielo, carving...I had the privilege to see most of these guys lecture in the flesh, always well worth it. ... and in the second he discusses his new theory on medieval sword design and aesthetics. This is fascinating stuff. Wow. Folks, watch this almost 90 minute presentation. Now go and browse through every sword book you own. Then go and check out your personal collection. It's like having augmented reality for swords. Oakeshott taught us how to categorise; Johnsson teaches us how to see in a whole new way. We've had the theory of physical sword properties in terms of performance for a while (static, dynamic, and harmonic balance); this presentation gives us a theory of the asethetics that overlays it. My personal guess is that Peter's right: this opens up a whole new vista of research into sword design, both in history and for the future. I've been following Peter Johnsson's ideas on sword proportions, but this is well beyond that. Well presented, clearly linked to designing other medieval artwork (drawings, paintings, architecture)... It's good that he looks very critically at his findings ("If you look for a pattern, you tend to find it") and not going all "Dan Brown" on it, as he put it. I'm tempted to put my Albion Earl through such analysis, but I'm not sure if I'd like the result, if the sword was designed before Peter discovered this "key"! Not to detract from Peter's very interesting work but in the name of clarity, a theory is a hypothesis that has: been published, been subjected to rigorous and protracted peer review, had findings replicated and confirmed by independent researchers in the field (the more the better) and suffered all the slings and arrows that can be thrown at it to such an extent that we can confidently use it as a basis for further research and hypothesis, for example, the theory of electro-magnetism or the theory of gravity. Until this time it is an hypothesis. This may seem trivial but it is imperative to define terms at the outset of any discussion, especially as there exists the 'crime fiction' definition of a theory as an unsubstantiated idea, a 'hunch' or a 'gut feeling'. Let's not fall into the same trap as the creationists who say of evolution "it's only a theory". That was amazing. Peter, bravo to you for coming up with and presenting this hypothesis. I can't wait to see how this affects future research! I've viewed almost all the videos and they are outstanding and very informative of theory and process. One can wonder in a which came first " the chicken or the egg " when it comes to the design theories that Peter shows us: By this I mean that does the geometry lead to better swords or do good sword conform to the geometry ? ( Handling and aesthetic/symbolism ). The relationship between proportions and mass distribution and geometric may be fundamental to " reality " as we perceive it. The geometric and symbolic methods, Peter talks about, that where a universal design basis for Medieval architecture, art and philosophical thought are not only a philosophical approach to design but fundamental to the physical world and what the human brain perceives as harmonious. An interesting exercise would be to take intuitive designs done without using the geometry/math, that most would agree are successful, and see how close they conform to the relationships of dimensions when one compares period swords and also when one uses the geometry to design a sword: Somehow I'm guessing that most aesthetically pleasing designs will conform closely to Peter's discovery. Maybe what happens is that an artist will get there intuitively, but with these tools one can take a lot of the guesswork out of the design process and even those without artistic talent would be able to use the geometry ? A bit like the golden ratio/rectangle being fundamental to pleasing proportions: One ignorant of the golden rectangle but with artistic ability will often respect those proportions without any knowledge of the math/geometry. I just watched the first of Peters Video's and I wish I had the time to go through them all RIGHT NOW, but it is Independence Day here in the United State's and I have an obligation to eat unhealthy amounts of red meat and blow things up. BUT... I need to echo the MC when he says how casually Peter puts up those sketches of nodes and balance points. What initially drew my interest in swords were those very things. How complex a "simple bar of steel" behaves both when put into motion and when impacted. I cannot believe this video is just up for free, I would pay good money to have this on DVD. When someone now asks me why it is worth it to purchase an 800.00 dollar sword, compared to a 260.00 dollar sword, I will plop them down in front of this video! It also shows what a bargain Albion's next Gen line really is when you consider the time and research that went into each piece. OK, I'm off for the holiday but had to say thank you. I can not wait to watch the others on this page. What a treasure. ... but it is Independence Day here in the United State's and I have an obligation to eat unhealthy amounts of red meat and blow things up. Nice - this cracked me up. To disambiguate what you are saying, are your three A's: Albion, Arms & Armor & Atrim? I just finished the first of Peter's lectures. I must say that this is quite possibly the most amazing video I've ever seen. At this point I want nothing more than to make swords for the rest of my life. 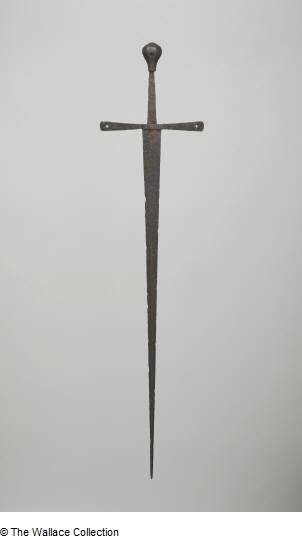 The sword that Peter used as a perfect example of this geometric system is Wallace Collection, A465, also known to us as Del Tin DT5144. I wonder how close a copy the Del Tin is of the original? It would be interesting for someone to do a new recreation of that sword. One question concerned the relationship of pivot points and vibrational nodes to the qudrangular geometry of a sword. I think Peter's answer was that you could locate these points using this system, but there is no indication that Medieval swordmakers did that.. If I misintrepreted, please correct me. Some correlations are obvious - the width of the pommel (65mm) is three squares away from the pommel to crossbar distance (around 184 mm)... Haven't come beyond that, I'm fighting my rusty Autocad skills... But I will post the outcome, be it success or fail! Yup, those three are the A's I was referring too, Albion, Arms and Armor, and Atrim. didn't mean to be unclear. And like I mention, there are certainly other smiths who pay attention to those mechanics, Tinker Pierce comes to mind. And seriously, over the last 8 hours I've had two burgers, kielbasa, some chicken, a couple ribs, and steak. But don't worry, the one ear of corn surly balanced that out. Peter, you really need to write a book. I think most of us here have a good understanding of the intricacies that go into creating an efficient and functional piece. To see it all summed up so coherently, however, renewed that respect. On a slightly unrelated note, I really liked the sword stand pictured at the 59 minute mark of Peter Johnson's second video. As pointed out by Michael Harley, until this hypothesis has seen some form of rigorous peer review and scrutiny it would be alittle premature to start thinking like this. We need a body of results showing how many originals fit these parameters, how many do not, what is the standard amount of deviation, or if indeed as Jean mentioned, all well proportioned swords will naturally fall into these ratios whether intentionally or not.